“The truth is rarely pure and never simple”, Oscar Wilde has one of his characters say in The Importance of Being Earnest. The same can be said about the motivations for our activism: rarely pure, and never simple. Those who think they do what they do for the animals only, should think again, or need to apply for sainthood or official enlightenment status. All of us changemakers and do-gooders (vegans or otherwise) have motivations that go beyond just helping the beings we want to help. We are also in search of recognition. We want to feel meaningful, have a sense of belonging, be important maybe. We want to be seen. We want to feel like we are good people. We have a need to be consistent. Maybe we want to atone for something we think we did wrong. Motivational speaker and author Tony Robbins put it very succinctly, and in my view very correctly. 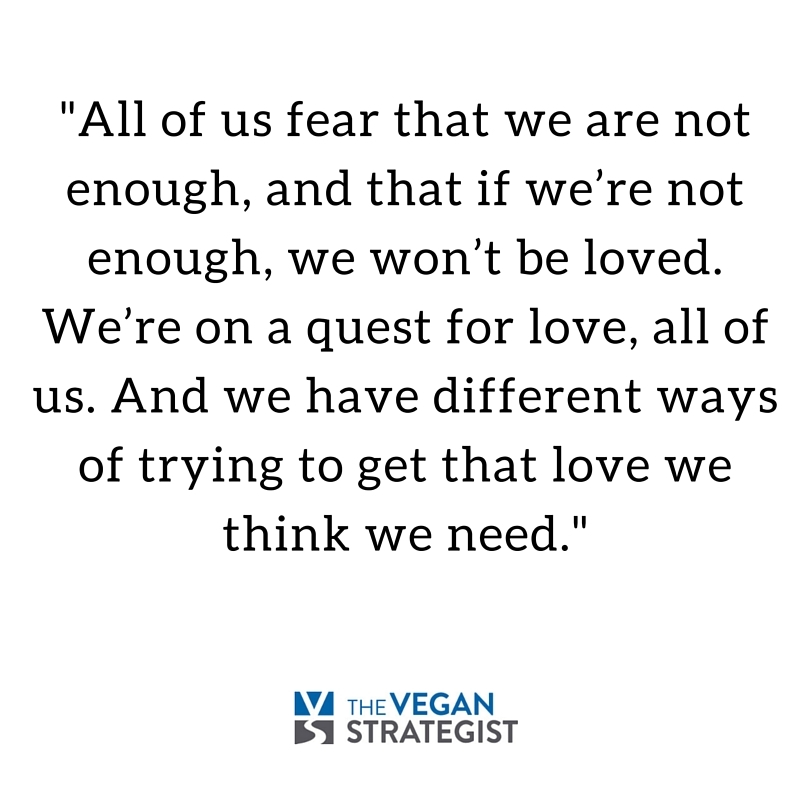 He says that all of us – in whatever culture – fear that we are not enough, and that we are afraid that if we’re not enough, then we won’t be loved. We’re on a quest for love, all of us. And we have different ways of trying to get that love we think we need. These feelings and motivations are indeed very human and are nothing to be ashamed of. Yet it is good to be aware of them and not pretend that they don’t exist and that we do what we do for the animals (or other humans) only. Because through being aware of these “impure motivations”, we may, whenever necessary, at least partially filter them out and see clearer. Sometimes this is extra necessary, because sometimes these motivations can really prevent us from being the most effective we can be. There’s an old Platters song called Smoke gets in your eyes. These more personal motivations, just like smoke, can get in your eyes too, preventing us from seeing clearly. With a general term, that shouldn’t be interpreted too negatively, we can call these motivations ego-centric. Let me be dead honest in this post and give you an illustration how ego-centric motivations can get into my own eyes. The other day, a friend told me she would be doing some research around an outreach strategy which I’m not particularly fond of. I caught myself thinking for a moment how I hoped her conclusion would be that this strategy is not effective. I hoped this because if it would turn out to be effective, it wouldn’t particularly fit within my theories and strategies. I am someone who has invested quite some time in thinking about strategy and developing strategies. So I would love it if my thinking is right and I don’t want it to be contradicted. Not only would much of my work appear to me as a waste of time, I would also lose face, both in my own eyes and in others’. It goes without saying that such an attitude, a confirmation bias, can blind me to some important information, make my theories etc more incomplete and less correct than they could be, and thus harm my advocacy. Not a good thing for the beings I want to help. I’m sure you can imagine other people who are married to their theories and ideologies to such an extent that they have trouble accepting any evidence, indications or even suggestions of something that contradicts them. Similarly, activists like to think that the kind of actions they do and are investing time in, are effective. Indications to the contrary may be experienced as threatening. 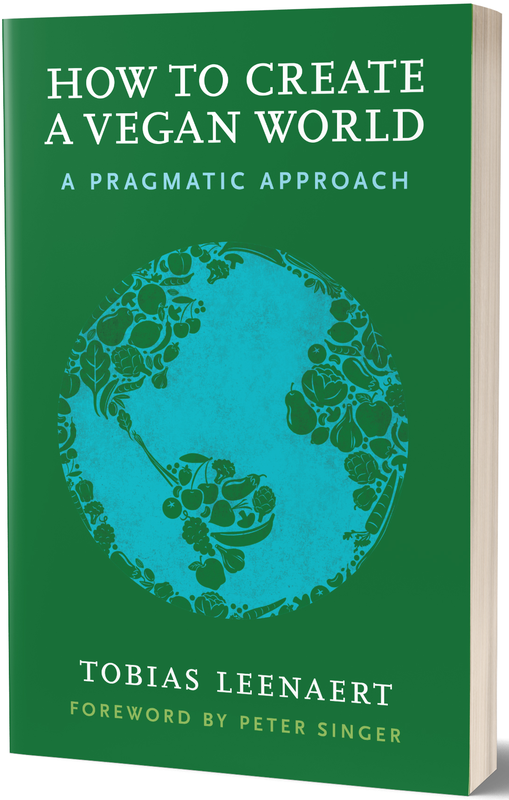 Still more general, as vegans we don’t want our veganism – an important part of our identity – to be criticized. Yet all this close-mindedness is not a good thing. Let me be honest on a meta-level too, about my motivation for writing this (this gets complicated!). Admitting to this, showing that I am aware of my own confirmation bias, is strategically a good thing to do. It may inspire confidence in others, who may think: this person tries to discover his own blind spots, and knows that he may be deluding himself. He is obviously trying to get to as much Truth as he can get. Maybe I’ll read some more of this guy. And this honesty may inspire even more confidence in you. And so on. showing our weaknesses, our awareness that we may have blind spots, our vulnerabilities, may inspire confidence in other people rather than the opposite. Thanks for this, Tobias. I do fear that your second paragraph paints with too broad a brush, making it sound as though everyone is equally guilty of ego-driven actions. I know a number of people (e.g., Paul Shapiro & Josh Balk, and a number of others) who really do pursue what they have found is the best advocacy for having the biggest impact. This has cost them friends and popularity. Again, I’ve seen this with others, too — their attempts to pursue animal-first advocacy is criticized and attacked, with popularity and “Likes” being more important. A very important post. Thank you. I see so many advocates stating that only one approach works. I don’t believe that to be true because human beings are a diverse and complex bunch! For example, the other day I was kicked off a page for stating that documentaries have inspired many people to go vegan (in particular Cowspiracy). I was told that only ‘vegan education’ makes vegans and despite my polite attempts at pointing out how dangerous it was to be so blinkered, I was blocked. There’s nothing wrong with having a particular strategy and we all have our own ideas of what does and doesn’t work. But I think we should always remain open minded and look to constantly learn. A very honest post and food-for-thought for all of us! It’s important – particularly in areas where debate or disagreement arise – to consider the broader picture in terms of our own personal reasons for getting involved with animal advocacy, and how such can impair us. The animals are counting on us to set our own egos aside when doing this work. Very impressive post. Your posts keeping getting more and more insightful and deep. Maybe you should consider a side career in psychology! I’ve recognized and grappled with this exact same issue, and (maybe I’m bragging and complimenting you at the same time) it takes a level of self-awareness, self-analysis, and self-honesty to realize and admit to all of this, not to mention a certain level of something else (courage? self-confidence?) to admit it publicly (which I haven’t). Whether or not activists can take this insight and apply to themselves and to their interactions with other activists remains to be seen, but at the very least it’s important that this knowledge is passed around, for the sake of discovering the Truth. it is indeed a tiny bit risky to publish this, but when i publish risky things, it’s always with the idea that admitting to something may make others allow themselves to feel and admit the same, which i think is most of the time a good thing, and taboos are mostly bad. Courageous and important topic Tobias! Thanks for going there. Allow a different opinion – I quote you : “The truth is rarely pure and never simple”, Oscar Wilde has one of his characters say in The Importance of Being Earnest. The same can be said about the motivations for our activism: rarely pure, and never simple. When I look at my little cat – she is very pure and very simple- she is The Truth. She and other animals are the truth we are fighting for in this movement- and that motivation is simple. If , however, one might forget – then there must be a small video from a slaughterhouse, something that reminds one of the motivation- maybe a wellclosed farming or slaugtherhouse ,which should put one on right course again. Think just at what happens in almost every country on slaughterhouses, same time while we live our life – two paralel dimensions…Is that so difficult? I think it is important to keep this in mind. So, we are here to build a better future, now that we are global, and to rescue the planet from stupid and obsolete traditions to give back the love and respect that animals deserve- that is our job. Let’s Communicate More Effectively For Animals! Have you ever wondered how you can make your voice more effective at advocating for animals? We’re running a how-to webinar on Nonviolent Communication, a technique that focuses on mutually respectful communication which supports harmony, cooperation, and everyone getting his or her needs met, without judging, criticizing, blaming, or labeling.